Jeff Sessions, the president’s earliest and most fervent supporter in Congress, stepped down as attorney general Wednesday after brutal criticism from the president, bringing an abrupt end to his controversial tenure as the nation’s top law enforcement officer. President Trump wrote on Twitter after a marathon press conference at the White House that Sessions was out and that his chief of staff, Matthew Whittaker, would serve as an acting replacement. Of course, there is that Russia thing. With Sessions out, Trump may attempt to limit or end the probe led by special counsel Robert Mueller III into Russian interference in the 2016 campaign and whether the president himself obstructed justice. But for today, smoke ’em if you got ’em Colorado! We’ll update with local reactions. Registered To Vote? Weed Discount! A Boulder-based dispensary chain is offering customers a stinky reason to get involved in the upcoming midterm elections. 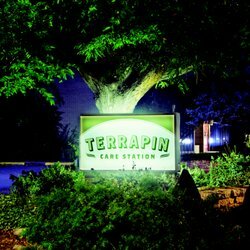 Five Terrapin Care Station stores across Colorado will offer a 10 percent discount on purchased products if customers show proof of voter registration. You’ll never get an easier discount on your ganja than by registering to vote in Colorado, since we have some of the most accessible voting laws in the country providing for same-day Election Day registration–and mail-in ballots as long as you’re registered before October 29, so you don’t even have to get off the couch. With that said, please do vote responsibly! 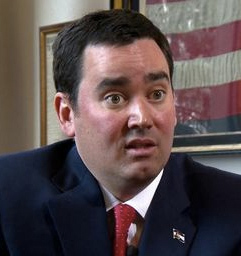 All those little bubbles tend to run together after a few tokes.
.@WalkerStapleton was booed at the #COGov debate last night for making a strange comment about his opponents children. That, gentle readers, is the face of the guy who never gets the joke, never tells the joke right, and never understands why nobody else is laughing. 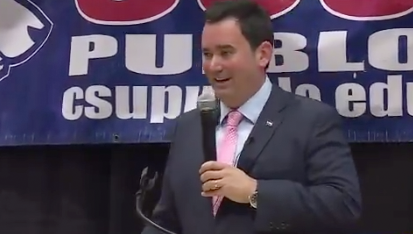 If it seems like every time these two candidates meet Walker Stapleton has some kind of bizarre highly embarrassing on-camera gaffe or meltdown, it’s because that’s exactly what’s happening. Again, maybe it’s a Bush thing. Is Trump Coming For Colorado’s Weed Or Not, Cory Gardner? Colorado’s system for regulating marijuana has too many loopholes that disguise illegal activity and jeopardize public safety, a federal prosecutor said Wednesday, detailing his motivation for boosting scrutiny in the first state to broadly allow cannabis sales. U.S. Attorney Bob Troyer said he is particularly concerned with how companies that grow marijuana account for damaged product and the state’s system allowing people to grow a certain number of plants at home for medical use. He said both situations create an opportunity for marijuana to be sold on the black market and require federal prosecutors to take a closer look at Colorado’s regulated marijuana industry. 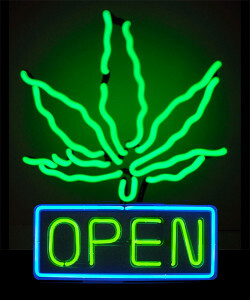 In 180-degree contrast to Gardner’s assurances, supposedly after talking to the President himself about the situation, that Colorado’s marijuana industry was not in danger of federal prosecution, this flat-out statement from U.S. Attorney Bob Troyer that marijuana businesses in compliance with state law are at “increased risk of federal prosecution” is deeply chilling–and not in the pleasant sense that follows a nice indica bong hit. 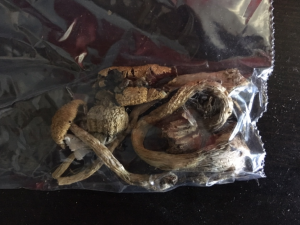 So what happens next? The industry isn’t reacting with public alarm, at least not yet. 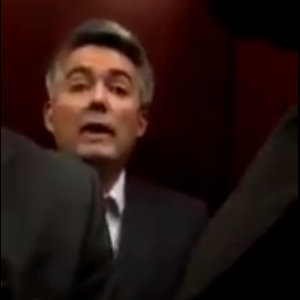 Cory Gardner has been silent so far on Troyer’s comments, with the high drama over Brett Kavanaugh’s embattled Supreme Court nomination hogging the spotlight. If the federal government’s interest here is merely to prevent black market diversion and not shut down the legal marijuana industry entirely, that would be one thing. But who can say that with confidence knowing how Jeff Sessions feels about the devil weed? As it stands now, everyone from individual tokers to investors with millions committed to this business should be worried–and Gardner’s assurances are looking awfully hollow. Grady Nouis, the Republican candidate for an Arvada area statehouse seat in the Colorado legislature, talks a lot about crime. He’s primarily concerned that so-called “sanctuary cities” endanger residents, because undocumented immigrants who may live in these cities commit crimes, particularly drug crimes. In the summer of 2005, Nouis was arrested and charged with felony manufacturing of hallucinogenic mushrooms. He ultimately pled guilty to “maintaining a drug house” and possession of marijuana. According to court records, Nouis was initially charged with one felony count of “manufacture of psilocybin,” and one misdemeanor count of “possession of marijuana.” A plea bargain reduced the felony manufacturing charge to another misdemeanor, “maintaining a drug house.” Nouis was sentenced to three years of probation and paid fees and fines totaling $1,660. Isn’t this what Sen. Cory Gardner, the “Trump whisperer” on all matters marijuana, should be saying? 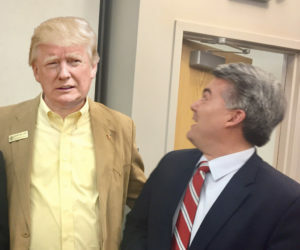 Sen. Cory Gardner, R-Colorado, remains “confident” President Donald Trump will keep his promise not to meddle with state marijuana policy despite a report that the White House asked federal agencies to compile statistics and stories that paint the drug in a negative light. “There seems to be a lot of interest in these storylines going around about how staff are trying to manipulate the president or to work around his firmly held policy positions – including the position he’s held since the campaign that marijuana policy is best left to the states …,” Gardner spokesman Alex Siciliano said. The storyline comes from an article first published Wednesday by BuzzFeed News about The Marijuana Policy Coordination Committee. It reportedly asked 14 federal agencies and the Drug Enforcement Administration to provide “data demonstrating the most significant negative trends” about marijuana and how it might threaten the country. The reported purpose behind amassing all these data points was to brief the president. Not to worry, says Sen. Gardner, who received a large helping of credit for “saving” Colorado’s marijuana industry from the threat of a crackdown by Attorney General Jeff Sessions after he interceded with Trump earlier this year. But setting aside the strange bedfellows of a conservative Republican championing the marijuana business, an act of political expediency that Gardner has reportedly had to explain to a great many unhappy fellow conservatives, there’s the larger problem that Gardner really has no control over the capricious decisionmaking of the Trump administration. Just like North Korea or any other matter on which Gardner has tried to run cover for Trump, he’s at the mercy of Trump’s inconsistency. Which means that, well, sure. If Trump decides it’s in his best political interests to crack down on weed despite it all, you can expect Cory Gardner will be left flapping in the breeze without even a moment’s consideration. In that event, we can only hope that the voices who praised Gardner so loudly for protecting their reefer last time will realize that a counterintuitive friend is oftentimes a fair-weather friend, too. Hickenlooper turned down legislation that would have added autism to the list of conditions eligible for medical marijuana, allowed for pot “tasting rooms” and opened up the cannabis industry to investment by public companies. Walker and others also slammed the timing of the veto at the very end of the day Tuesday, right before Hickenlooper left town Wednesday. Politically this unexpected series of vetoes of marijuana bills appears to be backfiring, with much more negativity about the vetoes in press coverage than discussion of Hickenlooper’s defenses offered in his veto letters. In the case of the autism bill, this anger at least partly results from Hickenlooper’s contradictory statements about the reasons–that there wasn’t enough data, then claiming flippantly that the bill could encourage youth marijuana use. In all cases these were bills intended to resolve legitimate issues, crafted with stakeholders on all sides, and supported by legislative coalitions that spanned the ideological poles. 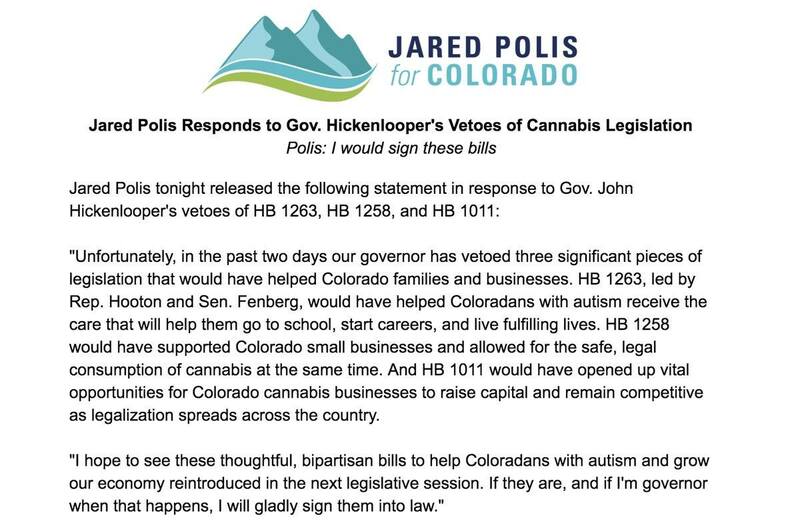 Vetoing these bills, especially with a record as governor of only very rarely vetoing legislation passed with bipartisan support, leaves a permanent blemish on Hickenlooper’s image with no political upside we can see. If that looks different by 2020, we’ll let you know. As of now it looks like a huge mistake. 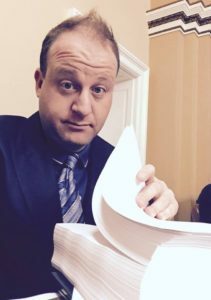 UPDATE: Democratic gubernatorial candidate Jared Polis weighs in–and says he would have signed them both. Currently, there are no legal places in Colorado to consume marijuana outside of a private home, making it difficult for renters, out-of-state tourists, and parents with young children to enjoy dispensary purchases. It’s possible that contributed to a 471 percent increase in citations for public cannabis consumption in the first three quarters of 2014, as Colorado Public Radio reported. Westword also reported that between the time of legalization in 2014 and 2017, Boulder saw a 54 percent climb. The bill would have limited purchases in tasting rooms to 10 milligrams active THC in an infused product or one-quarter gram of marijuana concentrate. In compliance with the Colorado Clean Indoor Air Act, customers would not have been allowed to smoke. Products would have had to be consumed on business premises. The bill passed the Senate in late April with a 22-12 vote, and the House in early May with a 57-8 vote. The governor’s stated reason for vetoing this legislation is the “concern” that allowing consumption of marijuana anywhere other than a private residence could lead to “additional impaired or intoxicated drivers on our roadways.” Notwithstanding the legal limbo that the absence of a legal place to consume marijuana leaves tourists in who come to our state to partake, creating a major policy conflict–by Hickenlooper’s logic, no one should ever be granted a liquor license again! After all, more places to drink would logically result in “additional impaired or intoxicated drivers on our roadways.” Right? But our brewery owner governor doesn’t see it that way. And that’s not a good look. Before Hickenlooper’s decision, parents of children with autism gathered outside the governor’s office at the state Capitol. One mother brought prescription bottles to show what her child has taken. She came in hopes of legalizing marijuana for autism. For the families of autistic children who pleaded with the governor to sign this bill, and who won the public’s sympathy this spring with a high-visibility media campaign highlighting what their families go through and how marijuana has helped, this high-handed sermonizing about the message to “young people” is a shocking insult. This bill was not about enabling drug use by kids, it’s about treating a serious disorder on par with any of the qualifying conditions for medical marijuana today. That’s why the bill passed by a lopsided 53-11 margin in the House and near-unanimous 32-3 in the Senate. Along with other recent lurches to the right like Hickenlooper’s endorsement of a work requirement for Medicaid and lip service to re-criminalizing marijuana entirely, these vetoes seem to be political moves to “sanitize” himself politically for a possible run for higher office. We don’t know exactly who is giving Hickenlooper the advice to take these actions, but it’s exactly the wrong way for him to be moving politically. Undoing any good will with the proponents of the autism bill by dismissing their concerns as an attempt to promote adolescent drug use, and punting the huge unresolved issue of legal marijuana consumption, is not how a governor shows leadership. It’s how you prove you don’t deserve to be President. President Donald Trump said Wednesday he regretted choosing Jeff Sessions as attorney general, a continuation of the President’s frustrations over Sessions’ decision to recuse himself from the Russia investigation. …Trump has frequently criticized Sessions over his recusal, which paved the way for Deputy Attorney General Rod Rosenstein to appoint special counsel Robert Mueller to investigate Russian meddling in the 2016 election. Trump, according to The New York Times, has said he needs an attorney general to protect him. Attorney General Jeff Sessions’ bellicose threats against legal marijuana have given the rapidly-growing industry in Colorado the most stress they’ve endured since legalization in 2012, but it does appear that he lost the battle for President Donald Trump’s blessing to carry out the crackdown he so badly wanted. That’s the local angle of relevance in this story–Sessions’ lack of favor with Trump being a positive development for Colorado’s marijuana industry–though obviously, Sessions’ recusal from the investigation into involvement by Russian nationals in the election of Trump is the factor driving the day. Will Sessions survive in his position long enough to headline the Western Conservative Summit in Denver in less than two weeks? We’ll all have to find out together. One significant policy change Stapleton would seek would be a crackdown on the roughly 150,000 state residents who still carry medical-marijuana cards, which allows them tax-free purchasing of the drug, the ability to grow their own plants and the ability to consume the weed at age 18. Moving all but medically necessary card holders into purchasing legalized retail marijuana would increase state tax revenues on the drug by two to three times and ensure that they couldn’t distribute home-grown cannabis to friends, creating a new stream of revenue for transportation and other needs, he said. That’s right, folks! The state of Colorado has never had 150,000 medical marijuana cardholders, and since the passage of Amendment 64 legalizing recreational marijuana in 2012, the number of patients on the state’s medical marijuana registry has steadily declined. According to the Colorado Department of Public Health and Environment’s latest report on Medical Marijuana Registry Program, in April of 2018 there were a total of 88,946 Coloradans with an active medical marijuana card. For those of you lacking a handy calculator, that’s 59.3% of Stapleton’s claim. Obviously this has a big negative impact on the utility of Stapleton’s proposed “crackdown” on the medical marijuana registry, since the amount of revenue that could be extracted from medical marijuana patients who were “cracked down on” is directly proportional to the total number of such individuals. Because there have never once been the number of people with medical marijuana “red cards” that Stapleton asserted “still carry” them, we really have no idea how to reconcile this discrepancy. Unless we already did, in the title of this post. We are proud to announce that the 84th Attorney General of the United States Jeff Sessions will be speaking Friday afternoon, June 8, 2018, at the Western Conservative Summit! On illegal immigration, Attorney General Jeff Sessions has returned our country to a rule of law. Attorney General Jeff Sessions joins our nation’s top conservative leaders in Denver, Colorado including: Attorney General Ed Meese, 2nd Amendment advocate Dana Loesch, Rep. Steve King, Rep. Ken Buck and the House Freedom Caucus, U.S. Senator Cory Gardner, Christian movie star Kirk Cameron, author Matt Walsh, Fox and Friend’s Ainsley Earhardt, YouTube sensations Diamond and Silk, Turning Point USA’s Charlie Kirk and Candace Owens, Parkland shooting survivor Kyle Kashuv, the Colson Center’s John Stonestreet, many of Colorado’s gubernatorial candidates, Alliance Defending Freedom’s President Michael Farris, Heritage Foundation’s Jennifer Marshall, former U.S. Navy Seal Chad Williams, and many others. Sessions is the biggest name on the confirmed speakers list now, which is sure to impart a very special character to this year’s Western Conservative Summit. It’s interesting that this announcement makes no reference to Sessions’ infamously dim view of marijuana legalization, a view strongly shared by the Centennial Institute’s director Jeff Hunt. As we’ve recently discussed, support for marijuana legalization both locally and across the nation is strong enough to make Sessions’ buzzkill threats against pot a significant political liability for Republicans in this already-challenging election year. 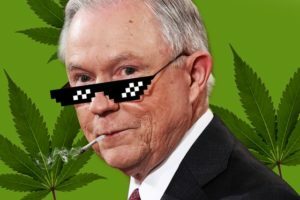 So needless to say, we’re excited to see what Sessions has to say when he arrives in the vanguard state of the wave of legalization sweeping America! The protest outside Sessions’ speech should be a memorable event, at least for those watching from a distance. Protesters toking up en masse in Jeff Sessions’ honor might have a fuzzier recollection. But if you’re a marijuana smoker anywhere near Denver on June 8th, toking up in Jeff Sessions’ honor will be something akin to a religious obligation. Jared Polis: The Governor Colorado’s Weed Industry Needs? After ten years in Congress, vocal cannabis reform advocate Jared Polis is now looking to become the Governor of Colorado. Polis, currently a representative for Colorado’s second district, is running on an ambitious campaign to provide the state with 100% renewable energy by 2040 as well as implement a single-payer health care plan. But as governor of the first state to legalize recreational marijuana, he would also preside over a cannabis market which has set the tone for the rest of the country. The solution, Polis has suggested, is a commission of lawmakers, citizens, and industry professionals to audit the effectiveness of Colorado’s current regulations. It’s no doubt that Polis will be missed among reform advocates in Congress, but if he’s able to smooth out the kinks in his state’s cannabis industry, he could still have an impact nationwide by setting a precedent for all the states looking to legalize in the next two years. When Colorado became the first state to legalize the sale and use of marijuana by adults without any license or medical prescription, it was risky territory for the state. The initial reaction from Gov. 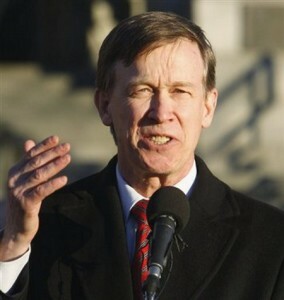 Hickenlooper and many other local political leaders in both parties was one of caution, with great doubt over whether the federal government would ever allow the legal retail sale of marijuana to begin. Six years after Amendment 64, Colorado’s nervous foray into legal marijuana sales has become a model that other states have followed–most prominently the state of California, whose retail marijuana operations began at the beginning of this year. Today, the rush of larger states to legalize marijuana has taken the pressure off Colorado as a petri dish for an uncertain experiment. The explosive growth and maturation of the marijuana industry has unquestionably validated the wisdom of legalization in 2012, and makes Gov. 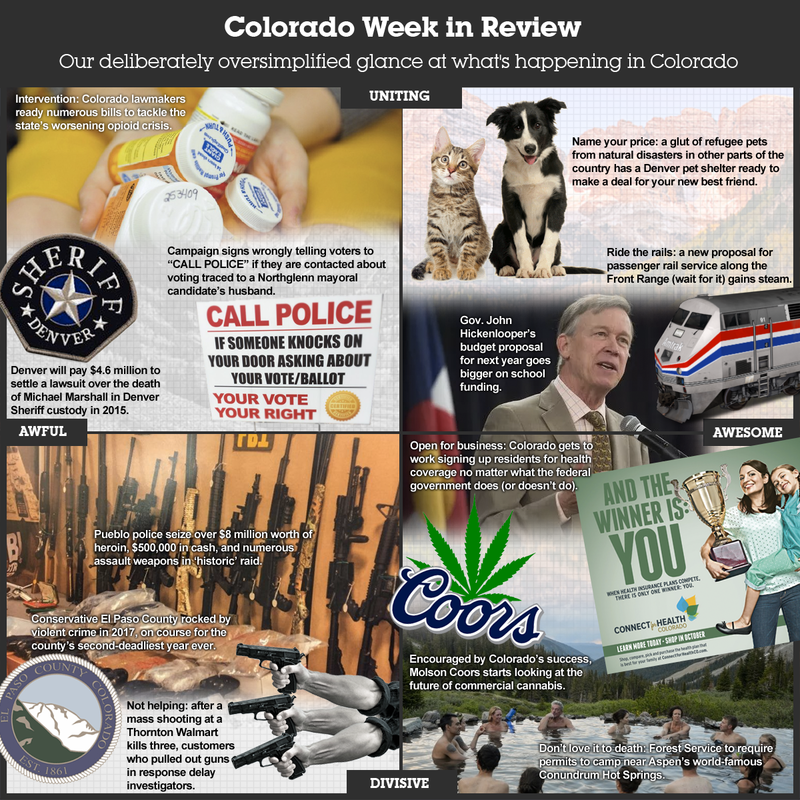 Hickenlooper’s recent well-publicized fumbles on the issue seem terribly out of touch. In the first post-Hickenlooper gubernatorial election, it will be very interesting to see how much influence the marijuana business wields. Whatever Hickenlooper says from day to day, public support for legal weed remains strong–so we don’t see Republicans campaigning in 2018 on a Reefer Madness platform of recriminalization. That means candidates will be jockeying to be the industry’s friend–and Polis has the bonafides here. Colorado Gov. John Hickenlooper has two facts in front of him: Since 2014 crime has been rising in his state, outstripping the national trend, and since 2014 recreational use of marijuana has been legal. Whether the two are connected is hotly debated — and if they are, then what? For the first time publicly, Hickenlooper told CNN he doesn’t rule out recriminalizing recreational marijuana, even if that’s a long shot. Yes, there are two sides to every story, and two sides to every coin, yada, yada, yada. 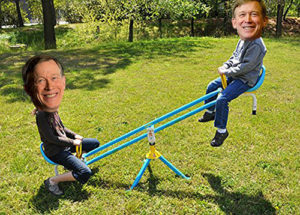 But if Hickenlooper is going to have another act in his political future, it would behoove him to present himself as more of a leader and less of a mediator. Ten years ago, this was a photo to end a political career–especially a Republican’s. 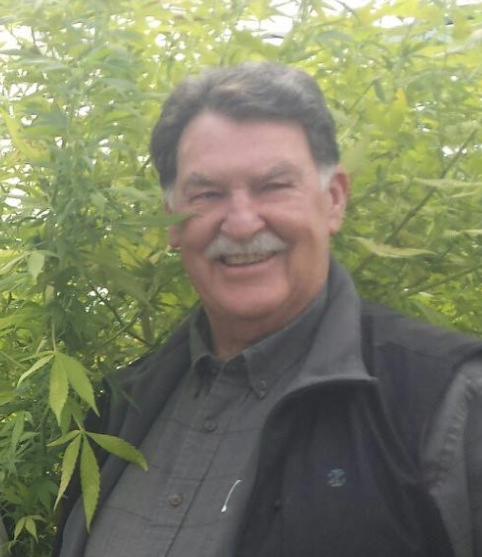 Today, it’s just Sen. Don Coram of Montrose in a marijuana bush. U.S. Sen. Cory Gardner is dropping his holds on certain Justice Department nominees “as an act of good faith” amid ongoing conversations with the deputy U.S. attorney general and the acting U.S. attorney for Colorado. Because obviously, the best way to negotiate is to give up your most valuable bargaining chips. Colorado’s Republican U.S. senator says there’s been enough progress on negotiations over marijuana with the Trump administration that he will stop blocking nominees for some jobs in the Justice Department. Cory Gardner used his power as a senator to freeze department nominations last month after U.S. Attorney General Jeff Sessions revoked Obama-era protections for states that have broadly legalized marijuana. Gardner said Sessions needed to re-establish protections for the industry. Gardner told The Associated Press on Thursday that recent talks make him confident the department won’t change the way it enforces federal laws in Colorado and other states that allow adults to use cannabis recreationally. News reports as recently as yesterday documented the continuing impasse between Sen. Cory Gardner and Attorney General Jeff Sessions over rescinding the Obama-era Cole Memorandum dictating a hands-off policy toward legal marijuana states. 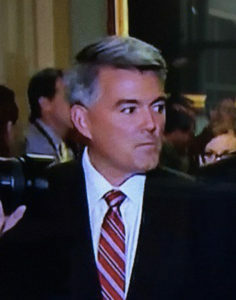 Gardner specifically stated in a Senate floor speech that he would hold Justice Department nominees until the Cole memorandum was reinstated. Since that time, however, pressure from law enforcement groups and conservative supporters of Sessions has built on Gardner to release his DOJ holds. On Tuesday, Jeff Sessions went public with criticism of Gardner’s actions, complaining that the holds were hampering his ability to fill critical positions. And today, Gardner announced he would release the DOJ holds for which he earned nationwide thanks from marijuana advocates. 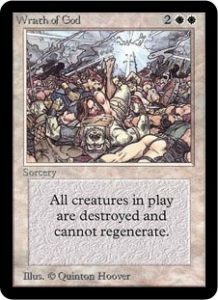 Without getting what he demanded. The Cole memo has not been reinstated, nor will it be now. The revised guidance from Sessions to U.S. Attorneys that provoked widespread fears of a marijuana crackdown remains operative. The industry has no real assurance other than Sessions’ apparent word to Gardner–which Gardner already blasted Sessions for breaking in the past. Anybody who is surprised by Gardner’s lack of courage down the stretch, please raise your hands. Nobody should be raising their hands. The members of the Fraternal Order of Police are disappointed and very frustrated by the vow made by Senator Cory S. Gardner (R-CO) to hold up all nominees for vacant posts in the U.S. Department of Justice following the decision to rescind the Cole Memo and restore discretion to our nation’s U.S. Attorneys on investigations into violations of Federal drug laws involving marijuana. Senator Gardner has come out swinging to defend the pot industry in his State. 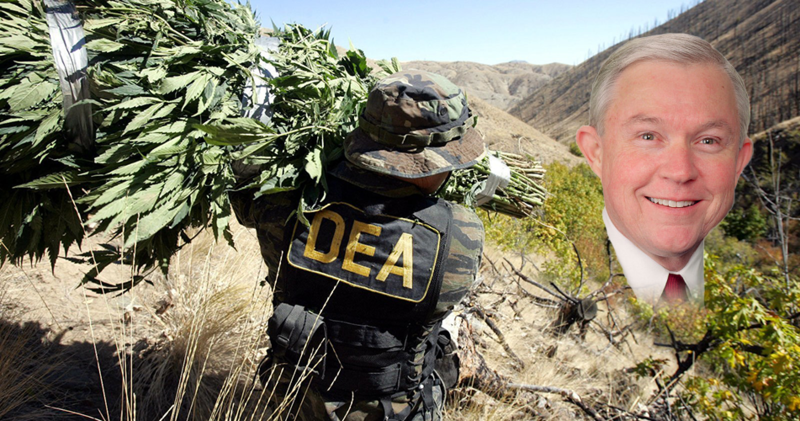 However, the fact that he believes Colorado can profit from the sale of this illegal drug does not give him the right to hold up or delay the appointment of critical personnel at the Justice Department. How can he justify putting at risk the public safety of all 50 States to advance the interests of the pot industry in his own? The FOP has repeatedly made our concerns about current vacancies in the Justice Department and other key Administration posts known. Senator Gardner does a real disservice to the nation as a whole and we urgently ask him to reconsider his rash and ill-advised obstructionism. Policy differences should be worked out by a dialogue and not turn into hostage situations. The ability of the Justice Department to carry out its nationwide mission should not be compromised by a single Senator trying to make it easier for business in his State to sell marijuana—an illegal drug as far as the Federal government is concerned. It’s usually a friend to the GOP, having endorsed Donald Trump for president in 2016, but the Fraternal Order of Police, the nation’s largest law-enforement [sic] labor union, has come out swinging at Republican U.S. Sen. Cory Gardner. What’s the beef? Gardner’s vow to hold up nominees to the many vacant posts in the U.S. Justice Department after the Trump administration announced it was giving the department more leeway to crack down on pot-legalizing states like Colorado. With Sen. Gardner’s support in polls quickly declining, perhaps most critically with base law-and-order Republicans who are generally speaking not big fans of the devil-weed, pressure on Gardner to fold on his nominee holds could become an interesting predicament for him. With Colorado’s U.S. Attorney having disarmed fears of an immediate crackdown on the retail marijuana industry following Sessions’ change of policy, though with plenty of uncertainty about the long term under the Trump administration remaining, Gardner may have taken an position that burns him no matter what he does next. But remember, the promise Gardner made was not to the cops. Attorney General Jeff Sessions wasn’t swayed to immediately change his mind about his decision to rescind the Cole Memo after Wednesday’s meeting with Sen. Cory Gardner despite the Colorado Republican’s threat to withhold Justice Department nominees. 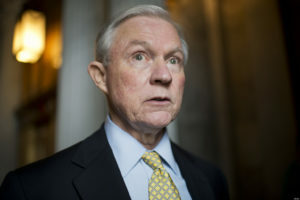 Sessions agreed to meet with Gardner Wednesday after Gardner loudly balked at the decision to rescind the 2013 memo that protects states where marijuana is legal from extraneous federal enforcement. As of today, Blair reports, Gardner’s Justice Department holds remain–but this last statement signals clearly that Gardner’s holds either won’t last long or won’t matter. For all the praise Gardner received after making his bellicose threats last Friday, that would be a sheepish end that should get at least as much press attention. Because as it turns out, maybe he really didn’t deserve all that praise. With that said, it would be a mistake to rule out entirely the possibility that legislation to tie the Justice Department’s hands in legal marijuana states will come about as a result of Sessions’ threats. As of now, Gardner has paid only lip service to the protection of Colorado’s marijuana industry–and without the kind of confrontation marijuana supporters hoped Gardner would lead against Sessions last week, the most likely outcome now is an uneasy status quo that may well outlast Sessions’ tenure as Attorney General. We’ll say it again and again: talk is cheap. And just like when Mike Coffman dropped his bid to force a discharge petition to vote on legislation to protect undocumented DREAMer students, Cory Gardner is getting credit that the facts of the situation do not appear to warrant. If and when that changes, we’ll gratefully acknowledge it. But it hasn’t happened yet. Learning about Attorney General Jeff Sessions’ decision to rescind the Obama-era protections at the Justice Department that allowed individual states to legalize marijuana for medical and recreational use, Sen. Cory Gardner flew into a rage from the well of the U.S. Senate last week–threatening in explicit terms to hold up every nominee for the Department of Justice unless the Cole Memorandum is reinstated as the operative guidance for U.S. Attorneys on marijuana prosecutions. The specifics of what Gardner are said are very important, since he is reportedly meeting with Sessions tomorrow to discuss the situation. After which, depending on how that meeting goes, Gardner will either lift his hold on Justice Department nominees or allow them to stand pending Sessions reconsidering his position. GARDNER: I agree with President Trump, that this decision should be left up to the people of Colorado and othere states. And I call on Attorney General Sessions to explain to me why President Trump was wrong in 2016 and what changed their minds. And that they reverse their decision to withdraw and rescind the Cole memorandum. And that they reimplement and reinstate the Cole memorandum. [Pols emphasis] And until that happens, I think I am obligated by the people of Colorado to take all steps necessary to protect the state of Colorado. And their rights. And that’s why I will be putting today a hold on every single nomination from the Department of Justice. Until Attorney General Jeff Sessions lives up to the commitment that he made to me in my confirmation–my pre-confirmation meeting with him, the conversation we had that was specifically about this issue of state’s rights and Colorado. Until he lives up to that commitment, I will be holding all nominations to the Department of Justice. The people of Colorado deserve answers. The people of Colorado deserve their will to be respected. Madam chair–Madam President–I yield the floor and not the absence of a quorum. Now, you can read this statement as Gardner laying out very precisely what Sessions needs to do to see Gardner’s nominee holds released: reinstating the Cole memo. The only problem is that Gardner, being an infamously crafty crafter of weaselly statements, separated his specific comments about the Cole memo from his announcement that he will hold up Justice Department nominees. You could, in a strained but literal reading, see Gardner only promising to maintain the holds until Sessions lives up to some unspecified “commitment.” Was that commitment specifically to preserve the Cole memo? It all gets kind of, you know, weaselly. The reason we’re asking these specific questions is simple: the chances that Sessions will actually reverse course and reimplement the Cole memo after meeting with Gardner seem very slim, but the odds that Gardner will come out of his meeting with Sessions tomorrow with those holds intact are even slimmer. Much like Rep. Mike Coffman’s abortive threat to force a vote on protections for undocumented students last summer, the most likely outcome here is, after receiving lavish praise for “standing up” to the Trump administration, Gardner folds without actually accomplishing anything. And if that’s what happens, those who issued said lavish praise should do a follow-up. In another edition of our long-running series, “At Least He’s Not Your Legislator,” we take you to Kansas, where a Republican lawmaker adds a racist tone to a conversation about legal marijuana. During Saturday’s Legislative Coffee session at St. Catherine Hospital, State Rep. Steve Alford, R-Ulysses, made an ostensibly racist comment when citing domestic Jim Crow-era drug policies. “Basically any way you say it, marijuana is an entry drug into the higher drugs,” Alford said. “What you really need to do is go back in the ’30s, when they outlawed all types of drugs in Kansas (and) across the United States. No word on whether or not Alford is friends with Colorado State Sen. Vicki Marble, who thinks African-Americans eat too much chicken. As we noted last week, Sen. Cory Gardner’s outrage over the decision by Attorney General Jeff Sessions to rescind Obama-era protections against a federal crackdown on marijuana in states that have legalized cannabis left un–or at least under–stated something very important: the fact that Gardner, alone among Colorado’s representatives in Washington, cast a key vote to confirm Sessions. This puts Gardner is a much more directly responsible position for Sessions’ actions than anyone else in the state. Gardner is right about Sessions’ mendacity, of course, although we think it’s a little late in the day to wake up to that fact. And the junior senator’s outsized outrage is highly suspicious. 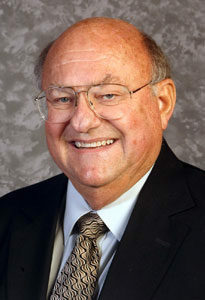 Like most of the state’s prominent politicians, he opposed marijuana legalization. And while his sudden devotion to states’ rights is interesting, it’s not particularly persuasive. …According to the website fivethirtyeight.com, Gardner has voted with Trump 94.6 percent of the time, despite the fact that Colorado delivered its electoral votes to Hillary Clinton, not Trump, in 2016. So much for his fealty to the will of Colorado voters. Without the endless benefit of the doubt Gardner is afforded by the Post and other members of the local pundit class, this is a much more accurate–if less flattering–examination of Gardner’s record. Anecdotal moments of “standing up to Trump” as Gardner went through the motions of with legal marijuana last week cannot erase the fact that Gardner votes with Trump almost all the time–including the highest profile votes of 2017 on repealing health care reform and slashing taxes on the wealthiest Americans. Not to mention Gardner’s vote to confirm Jeff Sessions. As frustrating as it may be to watch Gardner get credit he doesn’t deserve for what amounts to token CYA statements, this editorial sums up very well what Gardner should be afraid of when that finally stops working. As the saying goes, anecdotes do not equal data. And the record shows clearly, from Gardner’s condemnation of the Trump-energized racist right after Charlottesville to his faux outrage over Jeff Sessions, that Gardner has enabled the very things he decries. Anything less than a full acknowledgement of this, every time, is a disservice to the facts. Hopefully these words don’t come back to bite her (see below). Attorney General Jeff Sessions is rescinding the Obama-era policy that had paved the way for legalized marijuana to flourish in states across the country, including in Colorado, according to two sources. While Sessions has been carrying out a Justice Department agenda that follows Trump’s top priorities on such issues as immigration and opioids, the changes to pot policy reflect his own concerns. Trump’s personal views on marijuana remain largely unknown. This reported action directly contradicts what Attorney General Sessions told me prior to his confirmation. 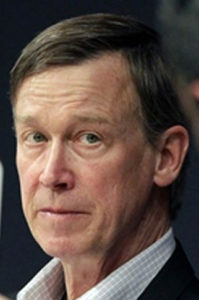 With no prior notice to Congress, the Justice Department has trampled on the will of the voters in CO and other states. The rub here of course is that Sen. Gardner, alone among Colorado’s delegation in Washington, cast his vote to confirm Sessions as Attorney General–meaning that Gardner is left holding the proverbial bag in this case more than anyone else in our vanguard legalization state. For all the noise Gardner is making in defense of Colorado’s marijuana industry now, he can’t escape at least partial responsibility for Sessions’ actions. Obviously we’ll be watching this developing story for updates, since Sessions’ next steps on marijuana will have a major effect on Colorado’s economy. Stay tuned. The “Hot mess” from California just got owned by Joy Reid. The 12/23/17 AMJoy Show featured Jen Kerns attempting to distract from the Russian collusion scandal by rehashing the Uranium One “scandal”. This was round two – after Jen Kerns U1 talking points were dissected by Reid on October 30. In Colorado, we’re used to Kerns lying, just making stuff up – and getting away with it, for the most part. In 2013, Jennifer Kerns emerged as the spokesperson for the recall effort against Senators Giron and Morse. The recall, ostensibly for the Senators’ so-called “anti-gun” votes, almost shifted control to Republicans in the Colorado Senate. Colorado Christian U To GOP: Hands Off Weed Money! Ernest Luning of the Colorado Springs Gazette follows up on one of the week’s more curious local political stories, a fundraiser for the GOP’s Senate Majority Fund 527 attended by members of the budding (pun) marijuana industry–an interesting change-up for a party that includes Attorney General Jeff Sessions, far and away the biggest threat to legalized marijuana in its short history. “It has come to our attention that state legislators are accepting campaign donations from the marijuana industry. As educators and researchers, we hope this is not the case. Marijuana has devastated Colorado by nearly every metric and we are particularly concerned about marijuana’s health impact on youth,” CCU President Dr. Donald Sweeting and Centennial Institute director Jeff Hunt wrote. “Colorado Christian University asks that you audit your donations for any money given by the marijuana industry and donate those funds to marijuana youth prevention and recovery organizations. We are happy to meet with you to discuss marijuana’s devastating impacts on Colorado. We look forward to your leadership on this issue and your work to make Colorado a better state for its citizens and especially its young people,” they concluded. As you can see, the question is not morally ambiguous to Jeff Hunt of CCU’s Centennial Institute like it appears to be with Senate President Grantham. For Hunt, taking money from the marijuana industry is little different from taking money from an organized crime cartel. But could you imagine Grantham saying it’s “up to individual members” whether they want to take money from Al Capone? With all of this in mind, might the Senate Majority Fund think twice about spending that freshly-raised marijuana cabbage? And if they don’t…will they answer to a higher authority? No wedge issue here. 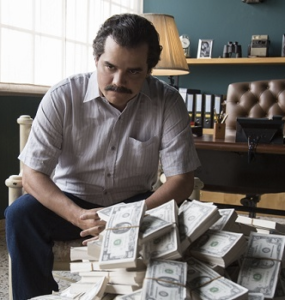 We’re not happy with any government official taking money from the marijuana industry. Republican or Democrat. Time for a conference call. 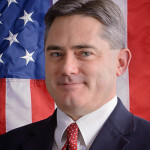 Senate Majority Leader Chris Holbert (R). All the progress that legalized marijuana has made in Colorado is nothing compared to what is about to happen on Wednesday. The Republican group co-hosting the event at Denver’s Capitol Hill Tavern is the Senate Majority Fund, a political group that uses its money to support GOP candidates for the Colorado Senate, primarily through advertising. The group’s aim is to make sure Republicans maintain their majority in the 35-member Senate, even if it’s only the one-vote lead it currently holds. It’s important to note that, although elected officials on both sides were generally unsupportive of 2012’s Amendment 64, the vote in 2013 in the Colorado General Assembly on the legislation that enabled the constitutional amendment to take effect–House Bill 13-1317–was split closely along party lines in the House. GOP lawmakers like now-Sen. Chris Holbert, who is quoted in Ashby’s story saying Amendment 64 is the law and of course Republicans are duty-bound to uphold the will of the voters, actually voted against the legislation to let said voters’ will take effect. Certainly we understand the marijuana industry’s desire to cultivate support (pun intended) on both sides of the aisle, so don’t mistake this for criticism of their efforts here–or the money they raise tomorrow night for Republican Senate candidates. The real question will be whether the substantial wing of the Republican Party that remains, in some cases fanatically, opposed to marijuana legalization is willing to tolerate Colorado Senate Republicans taking marijuana money.